All-in-one sub-ohm vapes are beginning to catch on recently. Recently, there are a lot more companies releasing the brand new “leak proof” design and simple, easy to use structure. However, can KangerTech manage to keep up with the competition in the new Kanger EVOD Pro. It is available from KangerTechs website, you can get your starter kit for $21.52, not including the battery! When it comes to the Kanger EVOD Pro, the overall design and structure of the device are impressive. However, aren’t all the modern All-In-One devices like this? It seems they’re simply following suit with the latest releases. They are adapting with the functionality of hardware, rather than the exterior design. Regardless, it’s still a good looking pen! The device comes in at around 133mm, this is excluding the drip tip. Making the EVOD Pro quite an enjoyable size. You will have no troubles putting it in your pocket and using the Kanger EVOD Pro as a daily vapor. Although I can’t confirm the actual weight of the device, I would say it’s average. It’s not too heavy to be too noticeable in your pocket. Yet, it is not too light to feel fake or like a poor design. Removable Battery – Due to the battery not being part of the fixed unit you can remove it from the bottom of the device. This allows you to easily swap out a battery when it’s coming to the end of its time. Not only does it give you this option, it also hosts a tiny adjustable section. This lets you manually push the negative connection of the case to the battery. It also lets you fully disconnect the battery from the device when traveling if you want. Using the LED indicator on the power button, it will then let you know when you have reconnected the battery! 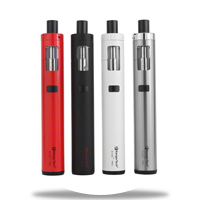 Color Variation – The Kanger EVOD Pro comes in 4 available colors. You get Steel Metal, Black, Red, and White. Each color has a professional clean cut finish. This makes the device look well-made and appealing to some. Hosting a black tip on every color variation. Internal Charing – Commonly found in other All-In-One structures, it is an external charging feature. This means you have to remove the battery to charge it. Despite the functionality the EVOD Pro allows you to remove the battery. You have the ability to charge the battery straight through the USB connector found on the back of the device. As a result, this makes charging on the go nice and simple! The performance of the Kanger EVOD Pro is moderate. The replaceable battery does give you the ability to replace when it’s getting worn out. You also have the ability to carry 2 batteries if you really want to maximize your vaping time. If that’s your preference, be sure to carry the additional battery in the appropriate safety travel container. The vapor production of the EVOD Pro, again, is moderate. It’s not impressive, but it certainly isn’t poor. It’s a great option for any entry level vapers looking for a clean and easy All-In-One design. However, I wouldn’t recommend it to any above entry level vapors. The device only allows the lip to lung inhaling, with the built-in airflow the hit is still consistent and smooth. The battery will take you about 1 – 2 hours to fully charge. Therefore, it’s pretty quick for a battery of this size. With the battery being a separate unit to the structure itself, the device won’t heat up too much. Sometimes, it happens when over using some devices. As mentioned before, the removable and adjustable battery housing gives you the ability to ease your mind in some situations. They are when traveling with the device, fears of pressing the power button in your pocket, or simply saving battery life. It’s clear that the Kanger EVOD Pro will stand out from the competition when it comes to the hardware functionality of the device. Conversely, is this enough? Granted the exterior design and the large tank windows does make it somewhat appealing. The clean cut all-in-one design is quite professional and appealing as well. I just hope it’s enough for people to see the amazing hardware functionality in this device. When you purchase the device, you will have to install the battery. Simply take the EVOD Pro in your hands and unscrew the bottom of the device. You will see a long metal block that you can twist. Once you have removed this you can place the battery in the device, positive side first. The battery will now be in the device, you can reconnect the bottom plate. When you’re putting this plate back on you will notice the battery is not fully in contact. Use the screw at the bottom to gently tighten the bottom. Keep an eye on the LED Indicator behind the power button. When it finds the connection to the battery, it will flash. At that point, stop tightening. Before using the device you will have to prime the atomizers coil. Holding the Kanger EVOD Pro in your hands unscrew the top of the device, above the tank and below the tip. When you remove this, you’ll see the connection between the atomizer and the tip. Using the juice of your choice put 4 – 5 drops on the white part of the coil that’s showing. You will need to drop some around the edge inside the tip as well. Once you have primed the coil, put the atomizer to one side and complete the step below. As the device is a top fill, it’s really easy to refill. If this is the first time using the device complete the steps above to prime the atomizer. Once you have removed the atomizer from the device, you will see the base of the Kanger EVOD Pro is now available holding the tank reservoir. Taking the liquid of your choice, fill up the tank until at the max fill line. You can find the location on the exterior of the tank. Once filled, screw the atomizer and tip back onto the device. Be careful not to over tighten. Take 4 – 5 dry hits from the device (WITHOUT POWER) to help the liquid circulate the atomizer. Wait for 10 – 15 minutes to allow the device to soak before taking your first powered hit. There’s not much needed to be done to maintain this device. Due to it being an all-in-one device it’s quite hard for anything to go wrong internally. However, be sure to occasionally wipe down the device to stop any buildup of dust. When the coil is starting to go dark, you can replace it to keep the vapor production and hit and a high standard. When preventing firing issues be sure to not tighten the battery too much. This normally happens when the connection between the atomizer and the battery has been pushed too far. With an all-in-one device such as this is quite uncommon for this to be an issue. However, it’s worth taking the steps to ensure it doesn’t happen to you. You can find any additional information on this device in the user manual. Be sure to always check the user manual before going online for information. Although information online is great and you can find a lot of helpful content, sometimes the legitimacy of the content can be questionable. Coming in at under $25 this device is a great price for a starter kit. We would highly recommend it for the price alone. However, remember they do not include the battery! The overall design is great, it’s a high standard and maintains a professional clean cut finish. However, it’s the same as the majority of other all-in-one devices, there is not uniqueness. The performance of the device is moderate, not too impressive yet certainly not disappointing. Overall, great performance and vapor production. The Kanger EVOD Pro is a great device, with a tiny price tag. It comes with a lot of functionality and some of the best hardware. It’s safe to say that all together this device is quite impressive, and I would highly recommend it to anyone looking for an entry level starter kit. Be sure to grab yours from KangerTechs Website now! The Kangertech AKD K-Pin is a starter kit with features, like a low-resistance coil, aimed to appeal to veteran vapers also. Read our review here.